Round Rock ISD taxpayers are not expected to see their school district tax rate go up if voters approve Bond 2018 in the November election. The District, which topped 50,000 students this year, would leverage the Bond to address growing enrollment, improve campus safety and security, upgrade instructional technology, and repair and replace outdated infrastructure systems at aging campuses. Currently, Round Rock ISD’s tax rate of $1.3048 is one of the lowest in the region. In fact, the Round Rock ISD Board of Trustees has lowered the tax rate since the passage of the 2014 Bond to its lowest level in 30 years. The 2014 Bond funded the construction of Joe Lee Johnson STEAM Academy, Pearson Ranch Middle School, the performing arts center at Cedar Ridge High School, and additions and renovations at McNeil High School, among other improvements Districtwide. Round Rock ISD uses savvy consumer strategies for reducing costs and maintaining its record-low tax rate, even with a new Bond. Like a smart consumer, the District borrows only as needed, seeks out the best rates, pays off debt early to reduce long-term costs, and makes regular payments. This established approach by the District’s award-winning finance department is recognized by the world’s top bond rating agencies. Round Rock ISD is the only school district in Texas, out of 1,200 districts, to receive a AAA rating from both Moody’s and Fitch credit rating agencies. Much like a consumer with a high credit rating, Round Rock ISD’s high bond rating attracts investors and allows it to borrow at low-interest rates, which reduces overall costs. Round Rock ISD’s finance department always looks for ways to reduce total debt costs, which include interest. Paying off debt early reduces total costs by cutting interest payments over time and saves on taxpayer dollars. Another tactic to absorb debt without raising the tax rate is to borrow only as needed by phasing in new bonds. Round Rock ISD will not borrow $508.4 million immediately—it will sell bonds in three phases. Districtwide projects and major construction take time to plan and implement. By phasing in bond sales, the District will borrow the money only when it is needed. This phased-in approach does more than reduce interest costs. Just like with big-ticket purchases in your own home, new debt is easier to manage when it’s spread out. Imagine buying new appliances for your kitchen. You might make the choice to buy all new appliances for $300 per month for a year, but that makes a big dent in your monthly budget. Or, you can buy one appliance per year for three years at a cost of $100 per month. The second option gives you greater flexibility in your monthly budget. 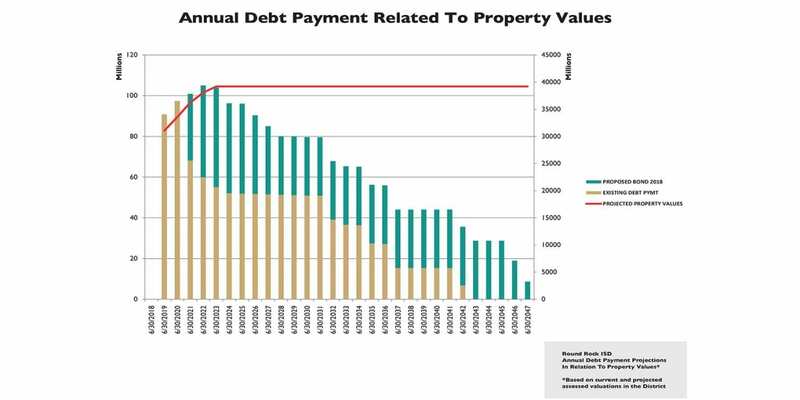 The growth and development of commercial and residential property in Central Texas will also help the District meet new debt obligations without raising its tax rate. Round Rock ISD covers parts of both Williamson and Travis counties, and in the cities of Round Rock, Cedar Park and Austin. In fact, Austin-Round Rock was just named as the fastest growing large metro economy in the U.S. in 2017, according to the Bureau of Economic Analysis. As more property is developed in Round Rock SD, the tax obligations are spread out to more taxpayers. Round Rock ISD’s projections are based on current assessed values and the District’s current proposed plan of finance. Changes in assessed values or in the plan of finance could affect these numbers. These projections are backed up by the District’s traditionally accurate projections for growth and the area’s hallmark growth and rising property values.